Swimming, snorkeling, banana boat rides, water ski, parasailing, etc. 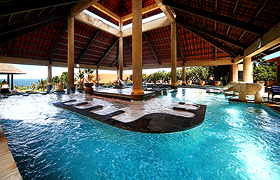 are arranged by most hotels and at the Beluga Marina in Tanjung Benoa. There are also small sail boats, catamarans, and boards for wind surfing for rent along Jimbaran Beach. 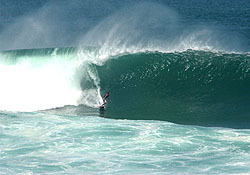 The most challenging of Bali’s famous surfing spots are near Ulu Watu (only for experts in top physical condition who are comfortable surfing over coral reefs on large, powerful waves that break in shallow water) and along Bali’s West coast North of Canggu; the best time is during the dry season from June to September. For details on the various locations please visit the Baliwaves web site or check Peter Neely’s “Indo Surf & Lingo” guide book. A number of companies offer yachts and fishing boats with guides for charter. The catch includes Tuna, Wahoo, Mai-Mai, Mackerel, or Marlin – and Snapper, Cod and Coral Trout to be caught reef fishing should you so desire. From US$625 per day standard fishing boat with fishing gears and US$1,155 per day for 30ft pleasure catamaran powered by 2 eco-friendly 4-stroke outboard engines, satellite navigation, top-of-the-range fish finder and sonar with experienced crew, full insurance, and all electronics and safety gear. Day Cruises: There are daily cruises to nearby Nusa Penida and Nusa Lembongan islands off the South-East coast of Bali. Guests spend the day either at one of the cruise companies’ beach clubs (with restaurant, swimming pool, water sports equipment) or on a floating pontoon, and you can go snorkeling, scuba diving, take Banana Boat rides, or view the underwater world from a semi-submersible vessel. You can choose between modern, air-conditioned motor cruisers accommodating 100 and more guests and a number of smaller sailing boats. For the more adventurous there is now also a 12-meter inflatable Ocean Raft carrying up to 24 passengers. Departure is usually around 9.00 a.m., and you return in the afternoon. Dinner Cruises: Some of the boats which leave in the morning for the regular Island Cruises offer also a Dinner Cruise starting around 17:45 p.m. After cruising around the Benoa harbour, an international buffet dinner and some entertainment by folk singers and live bands you return around 20:45 p.m. to the pier. US$45 per person, children up to 16 years 50%. For bookings and information call 703-060. Island Cruises: There are a number of cruises from Bali through the Lesser Sunda Islands, to Sulawesi, and the Moluccas. You can choose from modern cruise liners, luxurious private yachts, and traditional Buginese schooners, and either join a scheduled cruise from 3 days to 12 or 15 days, or even charter your own yacht or schooner with 2 to 16 cabins, experienced crew, and a Western tour guide. Please look at the different cruises and yacht charter options available or call 703-060 for information. GOLF The “Bali Handara Kosaido Country Club” near Bedugul in the mountains is probably Bali’s most attractive golf course.It features tall trees and flowers of riotous colour separating the fairway of this 18 holes championship course. Designed by Peter Thompson, Michael Wolferidge & Associates, Bali Handara Kosaido Country Club will make you feel a part of the rich, sporty, and exotic nature.It features tall trees and flowers of riotous colour separating the fairway of this 18 holes championship course. Designed by Peter Thompson, Michael Wolferidge & Associates, Bali Handara Kosaido Country Club will make you feel a part of the rich, sporty, and exotic nature. There is also a 18-hole course at the “Bali Golf & Country Club” in Nusa Dua near the Bali Hilton, a 9-hole course at the Grand Bali Beach Hotel in Sanur, and the new “Nirwana Bali Golf Club” with a 18-hole course near Tanah Lot. If you are interested in playing golf in Bali, please call 703-060 for bookings and information. Tennis & Squash: There are Clark Hatch Sports Clubs at the Sheraton Laguna and Nusa Indah Resort, Kartika Plaza Hotel, and Nikko Hotel each of which has several outdoor tennis courts, indoor squash courts, and complete fitness facilities. Playing partners as well as lessons are available. Most other 5-star hotels have at least some tennis courts which can also be booked by outside guests. For bookings and information call 703-060. Paragliding: Located on the Bukit (the hill South of the airport), a well-trained instructor accompanies you on a 20 minute tandem flight over the most spectacular strip of Bali’s coastline. For bookings and information call 703-060. Note: Available only in the afternoon, confirmation can be made one hour prior to the activity. White Water Rafting: Several companies offer exciting white water rafting tours (grade 2 to grade 4 rapids) on the Ayung river North-West of Ubud and — during certain times of the year — also on the Unda river North of Klungkung. You pass waterfalls and volcanic cliffs, deep sided gorges, tranquil rice terraces and remote villages. From morning to afternoon, US$76 per person including transfers from and to your hotel and lunch. For bookings and information call 703-060. Other Organized Adventures: Lake and Sea Kayakking, Jungle Trekking, and Mountain Cycling are arranged by the companies listed above. For bookings and information call 703-060. Bungy Jumping: A. J. Hackett in adjacent to Double Six, Legian, is the island’s only beach bungy tower with a lift. US$62. With the “Sling Shot” at the “Adrenalin Park” in Kuta you can get shot 52 metres into the air in just over one second, and they have an overhanging climbing wall, too. For bookings and information call 703-060. Horseback Riding: Experience Bali on horse back, ride through rice fields and along deserted beaches. Tours can be organized mornings and afternoons. For bookings and information call 703-060. Paintball War Games: The newly operated “Paintball Bali” is located on Jimbaran Hill and occupies about 3 hectares of exciting playing fields. Facilities include a large parking area, lobby with audio-video facilities, individual changing rooms and lockers as well as a staging area. For bookings and information call 703-060. Nature Tours: Visit the Bali Barat National Park in the West of the island, the Butterfly Park “Taman Kupu Kupu” in Wanasari, Tabanan, or the Botanical Gardens in Bedugul. Guided bird watching tours are offered starting from Ubud (in the village of Petulu a few miles north of Ubud you can also watch between 5:30 and 7:00 p.m. every day the arrival of thousands of white herons who are nesting here), and you can visit the bull races in Negara. If you stay near Lovina in the North, get up early one morning and hire a boat to watch hundreds of dolphins. For bookings and information call 703-060. The Botanical Garden, Ubud: This covers an area of five hectares and accommodates a natural ravine. There are an Orchid Garden, a vast collection of ferns, palms, bamboos and tropical trees, as well as Bali’s first maze. For bookings and information call 703-060. Bali Safari and Marine Park: This newly opened safari park is set in 40 hectares of land and located near Gianyar; there are safari vehicles to cruise the park and interact with 400 animals from Asia including Indonesia, India, and Africa. Introductory entrance fee is US$25 per person. For bookings and information call 703-060. Bali Zoo: “Nature’s Education Center” is home of more than 350 animals and located in Singapadu near Ubud. Daily programs include animal feeding (lions, crocodiles, tigers etc.) as well as animal petting e.g. you can touch and hold various birds and baby monkeys. Entrance fee is US$18 per adult. For bookings and information call 703-060. Paint A Pot: Jenggala is pleased to offer handpainting of ceramics – raw glazed of ceramics range from US$5 to US$21 each. A course in ceramic hand building is also available. This includes slabwork, pinch and coil techoniques, drop moulds and handthrowing. Rate starts from US$10 (2hrs per session – course completed within 1 week.) For bookings and information call 703-060. Balinese Dance & Music Classes: The YAYASAN POLOS SENI (Foundation for Pure Art) in Banjar Teges Kanginan, Peliatan, Ubud, e-mail polos@goarchi.com, offers Balinese dance and music classes for students who wish to become fully involved with the dance & music culture of Bali. Enrolling in one of these classes (one-to-one tuition and participation in group rehearsals and performances) means becoming a member of the family of students and teachers and an in-depth experience of the world of performers and performances in the Ubud area. There are also 2-week courses to learn playing the Gamelan at the MUSEUM SENI KLASSIK in Klungkung (e-mail anggie@gggamelan.com) which are open for all levels of experience. Beginners as well as “non-musicians” are welcome. Meditation Classes: Free Raya Yoga Meditation classes and regular sessions in Ubud and Denpasar, tel. 976-206. There are also free lessons every Monday 19.00 at the Denpasar Meditation Shop, tel. 237-260. Information on daily meetings, classes, books, tapes and videos from Bali Osho Information Centre, telephone 423-595. Balinese Cooking Classes: Discover the secrets of Balinese cuisine by joining one of the 1-Day Cooking Classes held by Heinz von Holzen, the author of the book “The Food Of Bali” and former food guru of the Grand Hyatt and Ritz Carlton (now Ayana Resort & Spa) hotels in Bali. You can visit Heinz in his beautiful BUMBU BALI restaurant in Tanjung Benoa next to Nusa Dua and enjoy their fabulous dishes at any time. If you wish to enrol in one of his popular classes, you better book in advance. Balinese cooking classes are also held in Ubud at the BUMBU Restaurant (tel. 974-217), at CASA LUNA (tel. 96-283), and at the nearby Sua Bali Culture and Information Centre (tel. 941-050).